Ecommerce web design & development. What is Ecommerce web design & development? Ecommerce web design is a term used for information to be transferred across the internet. It covers different types of businesses. Simply put it is a way to sell goods and collect a payment on the internet from a website. Building an Ecommerce website allows consumers to electronically exchange goods and services with no barriers of time or distance. Ecommerce has grown huge over the past few years and will keep growing. People just like you can start selling online and collect payments online on your own store or shop website. What Do You Need To Create An Online Store And What Exactly Is A Shopping Cart? What do you need to create an online store? You need to register a domain name. A hosting provider, some sort of way to make your website like WordPress and shopping cart software. You could even use a website builder that includes a domain, hosting and Ecommerce software. There are so many different ways for you to create your own online store that at times it could get very confusing on which type of shopping cart software you should use. Shopping cart software is software that lets you sell stuff online by displaying images and prices of products. Visitors can then see the products or merchandise, review what they have selected, make a secure payment and the product or merchandise they have paid for will be delivered to the buyer at the address they have specified. This is all done via a website. If your thinking of starting an online business then opening your own online store might be a good idea. What’s the difference between your online store and a brick and mortar store? The cost for one. Opening a brick and mortar store you need to sign a lease, have large amounts of money for deposits, rent and actual stock. Pay for electrics, phones and other things. Have someone in the store when its open. Only open certain hours of the day. Creating an online store is a lot cheaper. You can get a web design company to build your online store for you or you can try build your online store website yourself. All you need is a domain, hosting, Ecommerce software, some sort of website building creation tool and something to sell. Your online store is open 24/7 all year. People can purchase your merchandise from all over the world. Once you have paid for the stock you wish to sell, its a lot cheaper than a brick and mortar store as all you need to pay for is your hosting which only costs a few dollars a month. The design and layout of your Ecommerce store website can have a huge impact on sales because of usability, can visitors (potential buyers) find the product they are looking for? Does your Ecommerce web design have a good first impression with new visitors. When thinking of which Ecommerce solution to use remember that a well-designed Ecommerce website provides the visitor with a pleasant shopping experience, make sure your site is easy for them to browse, search, and complete the checkout process if they purchase products online. Web designers and web developers could charge you thousands of dollars to create your own unique design. Paying that sort of money should get you a fantastic up to-date design, but is it worth it? You could settle for a much cheaper option, and customize your design yourself by learning to make your own website. There are so many ready-made Ecommerce templates that you can purchase that it may be worth while to consider using a ready-made Ecommerce template. Remember you will be able to customize your ready-made Ecommerce template with your colors, images, and font-types making it unique. The theme, template or web design of your new store website will be the determining factor for a lot of your potential customers – whether they choose to buy from your store or not. When you are building a Ecommerce website make sure your priced right. Every item on your online store should have the correct price displayed where visitors can see it. And the price should be inline with other products of the same nature. Remember when potential customers do a search on Google your online store website will not be the only online store website they come across. For example if you are selling sunglasses type the product your are selling into Google in this case buy sunglasses and see the results. If you’re prices are not market related you will loose lots of potential buyers. You have a few options when it comes to creating an Ecommerce website. You could contact us and we could build your Ecommerce website or you could try create an Ecommerce website yourself. Question: How do I create an Ecommerce website? You can use WordPress to create your Ecommerce website. How do you get WordPress? We will give you a free domain for life when you sign up to our hosting. You will also save 20% when you sign up for one year or more. Once you sign up to the hosting we use and recommend you will be able to download and install WordPress onto your hosting account. WordPress is designed with ease in mind. You don’t need to have any coding knowledge or know anything about creating websites to be able to create your own WordPress website. Its made for people just like you that want to build their own website. Once you have downloaded WordPress onto your new hosting account you will want to set up your WordPress site. Follow the below guide on how to set up WordPress. WooCommerce, built by talented folks at WooThemes, is probably the most popular and widely used free Ecommerce plug-in for WordPress. Its packed full of lots of great top-of-the-line features. Use this powerful Ecommerce plug-in to turn your WordPress site into a multi-million dollar Ecommerce store. You also get lots of free and paid themes and extensions to help you set-up your online shop the way you want it. To start selling stuff on your WordPress site you will need to add Ecommerce software. You can install and activate the WooCommerce plug-in. Its free and easy to use. Click the link below to find out more. Now you will be able to sell both physical and digital goods in all shapes and sizes on your very own online store. Offer your customers product variations, multiple configurations, and instant downloads to shoppers, and even sell affiliate goods from online marketplaces. Remember that thanks to modern website builders like WordPress anyone can now create an Ecommerce website and sell there stuff on the web. No coding knowledge required. You could also use a Ecommerce website builder to create an Ecommerce website and sell your products online. But which Ecommerce website builder should you use? There are a few Ecommerce website builders that offer you an opportunity to build a free Ecommerce website but you will find that lots of the features required on the Ecommerce website builder are only available when you upgrade. So what you thought was free is not. 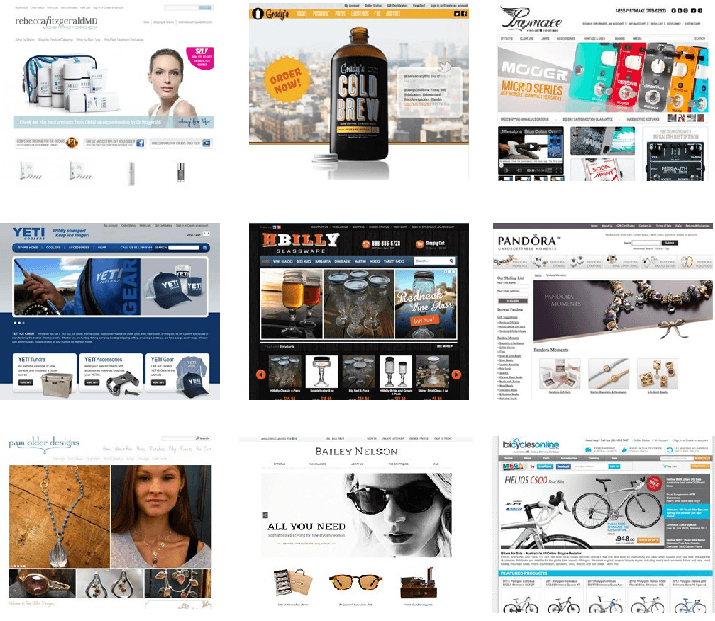 Using a Ecommerce website builder free trial would be a good choice. You get to use all the features the Ecommerce website builder has to offer for a certain number of days. This way you can try before you buy so to speak. Creating your own online store using Easysite is easy. Easysite has a free Ecommerce trail website builder that you can try for 30 days. That’s right you have 30 days to try all the features and start to build your own online store. No credit card details required, no money needed to try, try it free. When you create an online store using Easysite you will provide customers with a fully integrated shopping cart and a secure checkout experience directly from your eCommerce website. Easysites shopping cart software is set-up automatically on your own store page, start selling online immediately, no technical skills needed. When you are trying the site builder out you get a temporary domain. After the 30 day trial or any time before make a payment and you get a free domain for life. The free domain you get from Easysite is yours, even if you later decide to leave. Easysite will transfer your domain for free to a registrar of your choice. No questions asked. You can also have a domain you already own. Easysite provides fast reliable hosting which means you can be assured no matter how busy your site gets your hosting won’t let you down. Each site has unlimited bandwidth so you never have to upgrade. Easysite knows you are not a web designer and have no coding or web design knowledge that’s why their web site builder is designed with ease of use. If you can type a few sentences and want to build your own website then Easysite is your solution. Remember you can try it free for 30 days. Its important that your online store be responsive. What’s responsive? When you are building a website visitors could view your site on a wide selection of different devices. Responsive means that your website would be responsive no matter what device it was viewed on. In other words look great where ever its viewed. Your new online store website will be fully responsive when you use Easysite. The Easysite support team are on call to help you with any problems you may have. You can even request a call back and a support member will take you step-by-step through the website building process. There are also lots of helpful videos to guide you. How much does a E-commerce website cost – If you are going to use Easysite and build your own E-commerce website then it will cost you $19.95/monthly. No upgrade when your site gets busy. No limit on the amount of products you can have. No limit on the amount of pages you can have. You will never pay more thank $19.95/monthly when you create an online store using Easysite. Try creating your very own online store free for 30 days. See how it all works no credit card or money required fill in your details below and hit the get started now button to start building your online store today.